Last night’s blog got me to thinking… what are my family’s Christmas traditions??? Well, first of all… Christmas Eve is Oyster Stew. With none of my family around, meaning my parents and brother and sister, the only ones to eat oyster stew are Daniel and I. My mom would make split pea soup for those that didn’t care for oysters, but I prefer to feed them chili… or potato soup. A reading of The Night Before Christmas and the story from the Bible ended the night. My friend attended one of my Christmases as an adult child at my mom’s house… and was amazed to see us all pull out our pocketknives and slice the tape on packages carefully and fold the paper gently to be reused the next year. She was from a rip-the-paper kind of family and she was shocked! We gradually gave that up, but I admit, I still cringe when all that paper goes to waste! I tried once to get everyone interested in making cloth bags of all sizes to be reused, but Vernon just rolled his eyes at me. I thought festive Christmas fabric under the tree would be nice… oh, well. Christmas has always been MY HOLIDAY. I loved it. Even if during my childhood, I never had a party on my actual birthday! We might get to see relatives… or be somewhere different… and my parents always gave me two presents. One for my birthday (wrapped in birthday paper) and one (appropriately wrapped) for Christmas. Never a two-in-one combination. Never, here’s-pecan-pie-happy-birthday. I did feel guilty about having twice as many presents under the tree as my brother and sister, so I got good at unwrapping FAST so we’d end up at the same time! I love decorations, I love decorating… I love being Christmas Carol. I love that my dad took my mom and older brother and sister quail hunting on the day I was born!!! They stayed by the car, of course. So… what are your traditions??? Please share! To help get you in the holiday mood, here’s a pic of a neighbor I took the other day… you might recognize him from this summer’s post. (I don’t think he’s shaved since then!) We met him on the road, he was trailing cows down… but I couldn’t resist taking a photo of him. 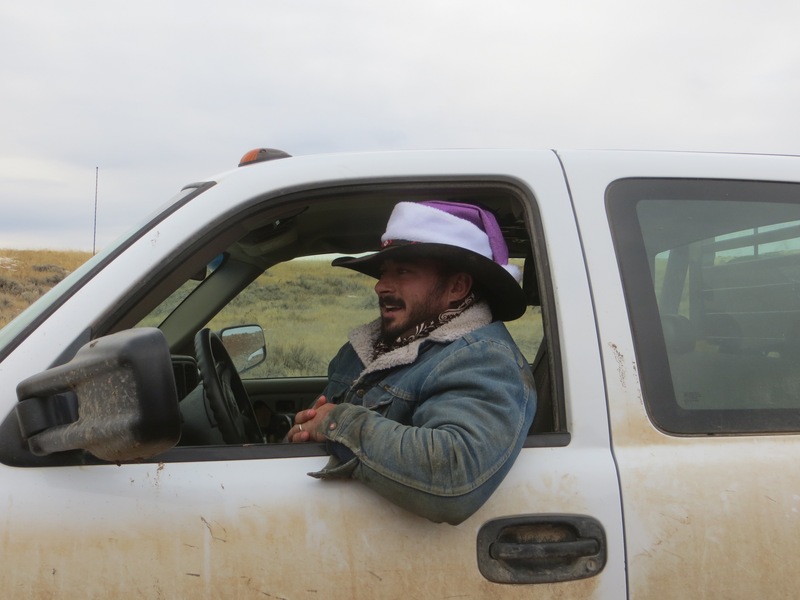 Yes, that’s a purple Santa hat pulled over his cowboy hat. HoHoHo! Merry Christmas!!!!! Mine is more for my grandkids to carry on. I give them each a different ornament. One gets horses, one bears and one dogs. They have their own trees now and look forward to what I send. Some are store bought, some I make. My siblings and I grew-up with St. Nick coming about a week before Christmas. He left filled stockings. That tradition is still going on. Nothing big, just a few fun things to get you more excited for Christmas and YES, sometimes there was the dreaded lump of COAL. I give ornaments too… first to my kids, now to the grands…but I hadn’t thought of just getting them one “theme”… I like that idea! Ahh. This makes me realize what we’re missing. Some things are the same. Some are not. I would like to see a picture of your cupboard in your living room decorated. I heard it is very pretty.